Let me first say I am not the inventor of the a mash diet. Like all recipes, there are many cooks with many variations. 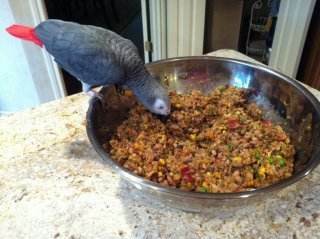 I thought I would offer mine to the mix in hope that parrots everywhere will enjoy it as much as I do! After about an hour, the beans should be still firm, but cooked to the point I’ll call al dente’. 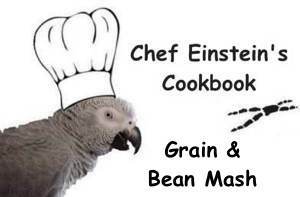 1 cup of Avian Naturals Dehydrated Veggies to the beans while they finish cooking. I recommend this product, but if you don’t have it, then you may need to remove about 1 cup of the water from the pot and add some chopped fresh carrots, diced bell pepper, frozen broccoli, frozen corn etc. Let cook at a low simmer until the sweet potato is tender. Steam or cook in a small amount of water, a 12 oz. bag of frozen mixed vegetables. (Corn, peas, carrots, green beans) Coarsely chop in a food processor. Add the Grain pilaf, previously prepared. Sometimes I’ll add (in moderation) safflower seed, chopped nuts (almonds, pecan, cashew, etc.) pumpkin seed, hemp seed, etc. I mix all of this together in a very large 16” diameter bowl, but any large container will work. For feeding, I combine one 2 oz serving with one 2 oz. serving of “Veggie Chop” for the evening meal. Just heat in the microwave and mix together.